Subscribe and stay tuned of Association Fromages de terroirs news ! Discover cheese-based recipes and submit your own! On 27 March 2019, the Raw Milk Summit is organised for the first time in France. A day of scientific and pedagogical conferences, open to everyone, need answers : families, the media, professionals, cheese monger, producers and students... For the first time, we will focus more on the benefits of raw milk for human health than on the risks, by examining all aspects of the subject in an objective and educational way : nutrition, physiology, infantile milk, cheese production, regulations, taste, gastronomy... with scientists, producers from France and abroad, chefs and bakers. Raw milk is what? physiology of raw milk, its components, vs sterilized milk (heat treatments, homogenization and their consequences), differences between milks. 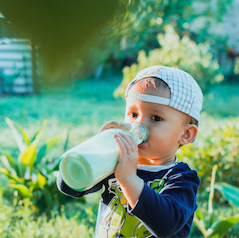 Why raw milk is an ideal drink for babys (after breastfeeding) and young children, with the presentation of a European scientific study. Regulatory and sanitory rules : are them adapted to small units? their evolution in a climate of increasing, understanding labels, what behind ? the sensorial qualities of natural milk for cheeses, cooking and pastry making, in the presence of chefs and patissiers. 20 euros (except students 10 euros with the card). Cheese lunch included. More informations : contact (arobase) fromages-de-terroirs.com or (0)1 42 76 96 82. 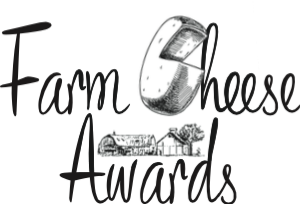 The association Fromages de Terroirs, whose vocation is to support, through its awareness and information actions, a dynamic of farm and artisanal production, launches the Farm Cheese Awards, an international contest entirely openned to farm cheeses made from raw milk and respectful of the environment. 100% raw milk, 100% farmer, 100% independent. On June 18, from noon to 6 p.m., on Sirha Green’s Green Stage at Lyon Eurexpo, the score of taste and quality will be played out, farm cheese against farm cheese. It is by going through a lot of cheese contests that the association had the idea of this event to offer a framework adapted to farm productions, which often do not have the means to compete, or whose characteristics by definition not formatted, are not judged according to a grid of criteria which corresponds to them. For example, defects in appearance are in most cases eliminatory or penalizing, whereas they are a quality for farm produce. Another example: for the same maturing period, a farm cheese will not offer optimal maturing for reasons of different manufacturing techniques using less technology or a less standardised quality of milk... This is why the association was convinced that it was necessary to organize a real competition dedicated, with an experienced jury, experienced in the tasting of this type of products that go off the beaten track of taste. To your calendars ! The National Cheese Day is being revamped with a new and even more appetizing program to showcase rare cheeses, small productions made with raw milk, everywhere in France, among participating cheesemakers. You are cheesemakers and you wish to participate : contact us on the association’s email, in the contact form. 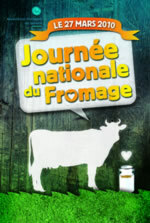 In the wake of the Salon de l’Agriculture and the Salon du Fromage, both held at the Porte de Versailles Paris in March, the 2001 National Cheese Day will be held throughout France on March 27th, reminding consumers and gastronomes that French cheese with raw milk is an important national theme. Much more than a food product, it symbolizes our culture, our know-how, the diversity and colour of our terroirs, the variety of animal breeds that have shaped the landscape, our gastronomic reputation in the world. If no one is surprised to see wine as a major cultural product, what about cheese ? Who knows the great cheese vintages ? Where can I find cheese cards in restaurants and wine shops that advise customers ? Is there a specialized press dedicated to cheese ? The association alerts French citizens to the trivialization of this highly symbolic product of a multi secular heritage. The From’Girls Calendar becomes a Collector ! From’Girls Calendar born in 2006, will not be published this year and will evolve in the coming months. The association is developing new art forms to continue to honor the raw milk cheeses on a trendy and contemporary tone as she always has. The old editions are still available for those who want to collect them. By purchasing these collectors, you help support our independent and unique action in France. To order, just click right on the screen. With the exception of 2009 and 2006, all editions are available while supplies remaining stocks. Enjoy it, there will not be for everyone !! Many thanks and all the best. The 10th edition of Cheese, Slow Food biennale dedicated to milk in all its forms, concludes with the very positive assessment of 270 000 visitors, including 30% from abroad. More than 300 producers from thirty countries and all continents have animated the streets and regaled visitors to their dairy products. a real discovery of even the most distant cheeses geitost Norwegian, Bulgarian cheese green ... a stroke of unexpected freshness in late summer. 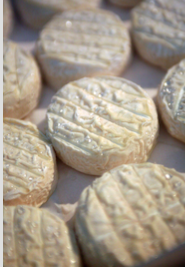 March 27, 2015 : National Day of cheese to celebrate the raw milk cheeses ! For centuries, Camembert cheese is a favorite of the French. It is also the most famous in the world but also the most copied . Everywhere we manufactures , Australia, Japan, New Zealand, Sweden ... But all these copies will not bear the mention of Normandy Camembert AOP made ​​with raw milk. We are lucky in France to be able to find true Camembert. There are still 4 or 5 producers continue the tradition as the Fromagerie Gillot. So we have no excuses because it is marketed everywhere, even in supermarkets , and frankly the difference in taste is huge! For a few cents more, enjoy yourself. The traditionnal cheeses are hitting the headlines with the calendar. They are the stars.For the 10th birthday of the From’ Girls Calendar, the Association chooses to show the traditional cheese through movies where talent, beauty and celebrity make only one. Elegance, refinement, smile, colors as the 7th art, the real cheeses offers every day to the cheese lovers a universe of pleasure and dream. You can order it now on our web site, home page. Enjoy ! President Charles de Gaulle famously remarked on the impossibility of governing a country that produced so many cheeses. But that was in 1962. Today it might be just as hard to govern the country, but it has nothing to do with cheese - because 90% of the producers have either gone to the wall or are in the hands of the dairy giants. This is thanks to a mixture of draconian health measures in Brussels, designed to come down hard on raw milk products, and hostile buyouts by those who want to corner the market. Ten years already that the Association created this public and festive event for the gratitude of the unpasteurized milk cheese, for the preservation of the confidential and farm productions which constitute the base of our food-processing history. It was necessary to mark the occasion by celebrating the tenth birthday of the national cheese day to Georges V together with about forty journalists and Hervé Mons. By choosing this splendid place, our association wanted to show that if the champagne and the other great wines have their place under the golds of luxury hotels, traditionnal cheeses deserve too the same treatment, in homage to the secular inheritance which made the reputation of our cheeses in the world. Much more than quite other food, the cheese symbolizes our culture, our know-how, the variety and the color of our landscapes, the variety of the races of animals which shaped the landscapes, our gastronomic reputation in the world. If anybody does not wonder to see the wine placed to the rank of the big cultural products, that is it some cheese? Who knows the Grand Crus of cheeses? Where find menu of cheeses in restaurants and a specialist who advise the customers? The association alerts the French citizens on the everyday acceptance of this product nevertheless highly symbolic. France kills itself the real camembert by authorizing pasteurization in the PDO in 2021 ! What means PDO ? Ancestral, loyal and constant customs. Three words engraved in marble when France created the appellations of origin at the very beginning of the 20th century. The Camembert de Normandie, is still a symbol of our country of cheese, but il will change if we let pasteurization coming in 2021 ! This means levelling down, which will be accompanied by stopping the "moulage à la louche". Finish the real taste, finish the typicity ! History is definitely repeating itself. The four Norman PDO have not enought learned from the past, it is inexorably sinking into mediocrity. By wanting to remove the term "Normandy" from industrial camemberts, in other words to apply the european law (after 20 years of laxness), the camembert de Normandie inherits the worst scenario to get out of this arm-wrestle between the artisan of the "Normandy" camembert PDO and those, "made in Normandy", the industrial copy, of which Lactalis is the first operator with 95% of the production. The end of the "Made in" ends with a bif PDO for all, declined in two versions: one basic under "Camembert de Normandie" and the other, more qualitative, under "Véritable camembert de Normandie". The law of the market will require that 9 out of 10 PDO pies be pasteurized and industrial, manufactured in a chain like common products. Therefore cheaper.